Whether it’s at the rack, over the road, at your specific jobsite or location, or even on the water, Flyers Energy is here to help fuel your success when and where you need it. 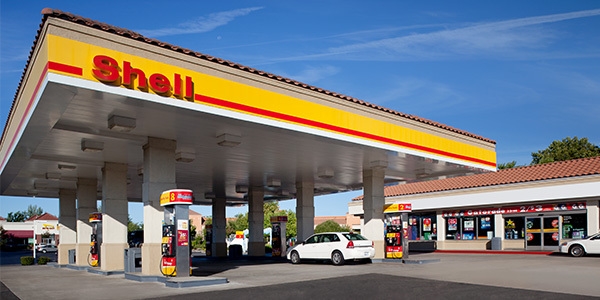 Flyers Energy partners with the top brands in the industry (Chevron, Shell, Valero, & 76) to deliver fuel directly to your privately owned gas station in California or Northern Nevada. With the cleanest trucks and best drivers in the industry, you and your customers will always be assured that you have the best solutions for your retail site. 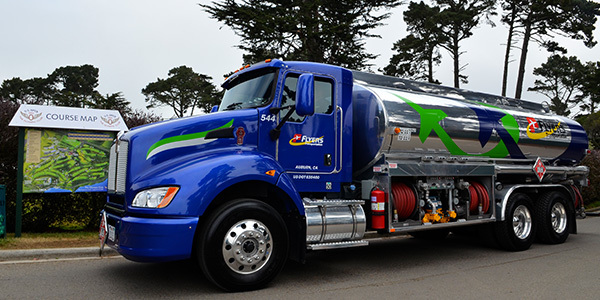 Flyers Energy is one of the largest distributors of quality unbranded fuels in the California and Northern Nevada regions, providing all grades of gasoline and diesel where you need it and when you need it with 24/7 dispatch and deliveries. We supply national gas station chains, locally owned gas stations, trucking businesses, railroads, construction businesses, as well as a variety of other businesses. 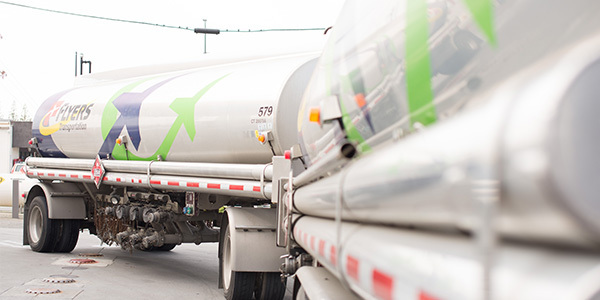 Our Truck & Trailer transports haul loads of fuel around the clock all over California and Northern Nevada. 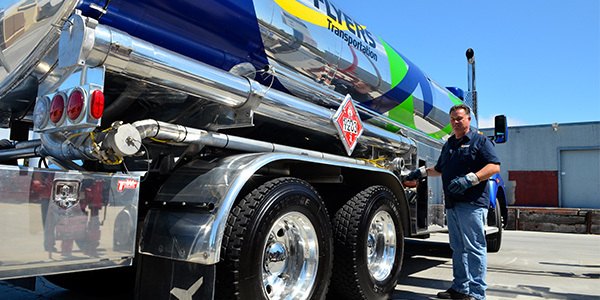 With competitive pricing and experienced representatives, Flyers Energy is the choice of 230 independent fuel stations to manage their keep-full fuel contracts with Valero, Chevron, Philips 66 and Valero. If you’re looking to buy in bulk and need 4,000 gallons or less, our fleet of bobtail trucks deliver what you need. Flyers Energy also brings convenience with on-site deliveries to your tanks, on your schedule. 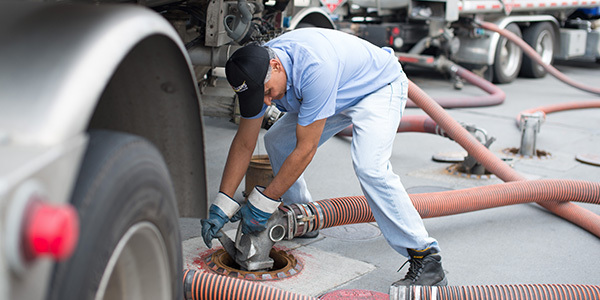 We offer worry-free keep full service, tank monitoring, as well as daily deliveries. Whether you need regular, mid-grade, premium or diesel (red dye & clear), Flyers Energy can fulfill your bobtail needs. Flyers Energy is a United States Coast Guard certified and approved over water fuel transfer supplier with a California Fish and Wildlife approved facility response plan. Providing what you need, we service tug boats to diesel barges with convenient fueling and the ability to adjust flow rate to high flow fueling. If you happen to have any over the water transfer needs, contact us today. Cut out the middle man. Flyers Energy is a shipper of record, supplying you with Flyers Energy product at the rack from terminals in California and Northern Nevada. This includes individual loads, contracts, and fixed-forwards. Let an experienced representative help you get started. Give us a call today for a quote on your next load. 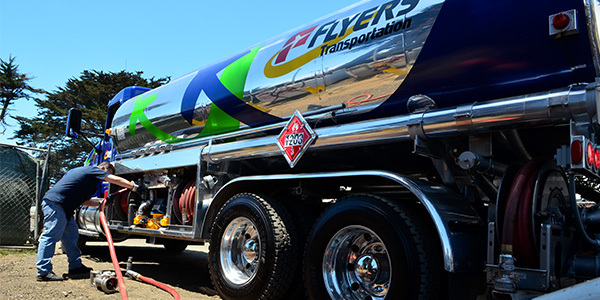 Flyers Energy Mobile Fueling Service, also called wet hosing, delivers fuel around the clock directly into your company vehicles or equipment. At the start of each shift, trucks are full of fuel and ready to get on the road where company productivity is highest. 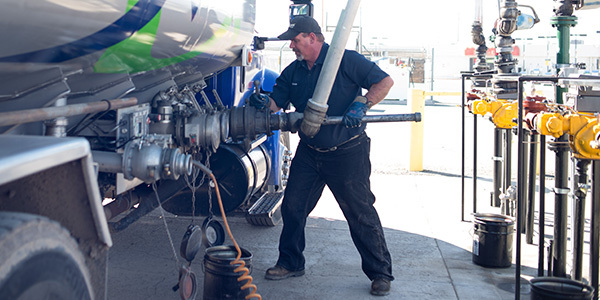 Mobile fueling helps control usage and ensures your drivers waste no time at the pump.